Each month we have a snack of the month that we are able to share with our clients and have samples in the waiting room and this month we are excited to share Kize Bars! 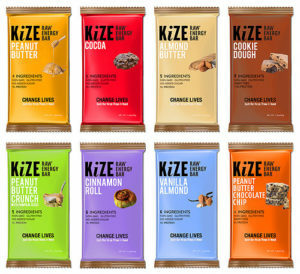 Not only are we loving how these bar taste and fuel the body, we are loving the Kize Bar mission and what they stand for. Check out their passion here. Kize leads with heart. Along with creating a tasty snack, they are inspiring change in the world. Each year they head to Haiti to help out a community. 10% of each Kize Bar purchase goes to those in need. Through these efforts at Hope House in Haiti, 1,000 kids are fed each day. Kize has been able to help out this community and help the children of this community. Along with feeding the kids, the team at Kize is helping the community learn how to be self-sustainable and thrive not just survive. Lastly, Kize is a pure pick me up! Their social channels and messaging everywhere will leave your heart filled: “Change lives and love people through service and food.” If we could give them a high five, we would. Please check out Kize bars and what they are about. Choose a food that fuels you. It makes a difference!